Ideal for smaller print shops and mid to large in-plant printing centers, the Formax FD 120 Card Cutter offers on-demand processing of full-bleed color business cards, postcards, greeting cards and photos. 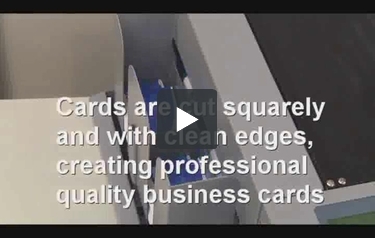 With its small footprint and easy-to-use control panel with LCD display, you'll be creating professional quality cards in no time, even from your desktop. The FD 120 cuts both letter and legal size documents in paper weights up to 300 gsm (110 lb) and automatically cuts and slits documents and stacks them in sequential order at speeds of up to 130 business cards per minute. Save time and effort by customizing up to six programmable jobs or utilize the six pre-programmed jobs. And for even greater productivity, we offer an optional postcard and photo slitter cassette and greeting card slitter cassette. Applications: Standard slitter cassette: Letter size 10-up 2" x 3.5" business cards, Letter size 4-up 3.5" x 5" post cards. Optional slitter cassettes: Letter size 2-up 5" x 7" photos/post cards, or Legal size 3-up 4" x 8" greeting cards. Paper Sizes: 8.5" x 11" and 8.5" x 14"
This cutter is a great addition to our print shop arsenal. It can definitely handle the load, and it will cut card stock thicker than 300 gsm with ease. Our heaviest paper is a 120# Cover with a 325 gsm, and this cutter has no problem doing the job. So far we are very happy with this cutter! How do I get the cartridge for greeting cards for this machine? Because the additional slitter cassettes are accessories that are a non-stock item you would just need to give us a call @ 1-800-944-4573 and we can help get those ordered for you.